As you can see, the Haney tower is a very crowed place. Since there are many other commercial radio sites located in and around this site, interference has been a major concern and problem. Haney is located on the side of a small mountain north of the Albion ferry, which crosses the Fraser River at Fort Langley. Packet signals can be heard from Chilliwack to parts of southern Vancouver Island, as well as in most parts of the Lower Mainland. Antenna height above sea level is 343 - 397m or 1125 - 1302 feet. Again, as with all our sites, we have full power back-up with either 12 volts DC, or 110 VAC. A generator supplies the large battery strings. This site can be reached all year round. 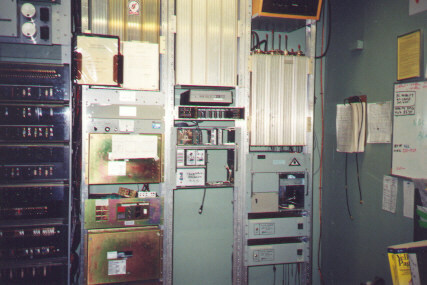 Haney is the access point for VE7CQD, a ham BBS and DXWHO, a DX Packet Cluster. A closer look at the upper right hand side of the tower will reveal a rectangular antenna known as a Scala CL-400 Log Periodic Array in a radome. 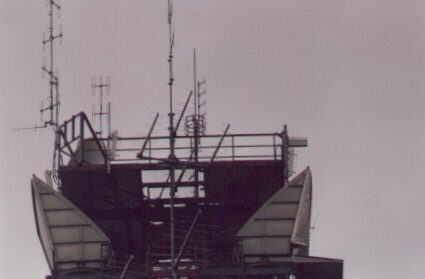 This became the club's standard backbone antenna. The radome was designed by Scala for the severe ice loading common in the Pacific Northwest. 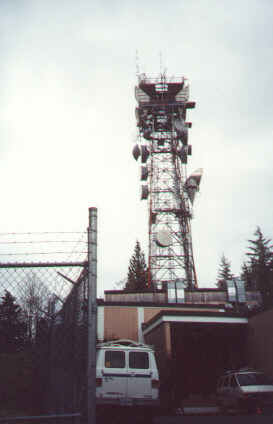 In 2005, during renovations of the main radio building, TELUS moved the TPARC equipment into the trailer that is used by TELUS Wireless. This has made access a little more of a challenge, but at the same time it secured our future for the foreseeable future.